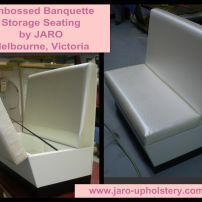 commented on "Embossed Vinyl Storage Banquette Seat"
The Embossed Storage Banquette is available in some amazing embossed vinyls. Lovely designs for the ladies and manly types for the men. Great for commercial or domestic use!